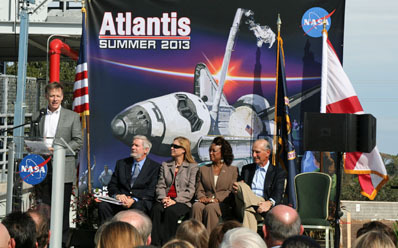 Kennedy Space Center tourism officials, Florida's lieutenant governor and the final space shuttle commander Wednesday morning broke ground on the $100 million complex that will showcase the retired orbiter Atlantis. 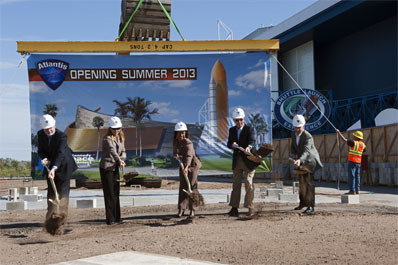 Construction of the 65,000-square-foot, 6-story-tall exhibit will begin soon in preparation for receiving the spacecraft early next year and a planned summer 2013 grand opening to the public. 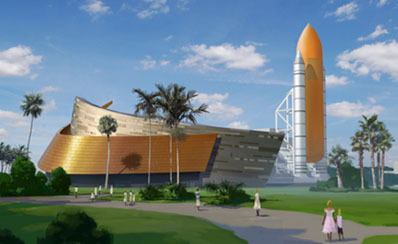 "The largest project ever undertaken here at the Kennedy Space Center Visitor Complex ... is the new, $100 million home for space shuttle Atlantis, a place where NASA's longest running spaceflight program will be honored," said Bill Moore, chief operating officer of the Visitor Complex. KSC's museum area has been run by the commercial Delaware North firm since 1995. They also constructed the sprawling Saturn 5 facility that houses one of the leftover Apollo moon rockets. "It is an honor to create the home for space shuttle Atlantis and to work with NASA to tell its story to the world," said Jeremy Jacobs, chairman and chief executive officer of the Delaware North Companies, said at the groundbreaking. Plans for Atlantis call for the orbiter to be displayed on support struts at an angle, its 60-foot-long payload bay doors open just like the ship was flying high above Earth, and spectators being able to walk around to see all of the vehicle's exterior. "Atlantis will be on exhibit as if she is on-orbit with payload bay doors open doing what all the shuttles did remarkably for those 30 years. Not only will our guests be able to get close to one of three space-flown orbiters, they will engage in lots of interactive activities and simulators used to grab satellites (and) crawl through a model of the International Space Station," said Moore. The building also features plans to "tell the story" of the Hubble Space Telescope that the space shuttle program launched, fixed, upgraded and maintained on numerous servicing calls. And the International Space Station that the shuttles helped assemble in orbit will be prominently highlighted. "This is not just a story about the hardware, this is really a true story of the hardworking people who worked together -- thousands of people -- to do amazing things," said Moore. "The shuttle home is going to be an emotional experience for all of us. 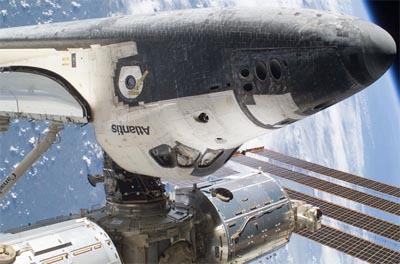 I expect to see tears of joy seeing this amazing vehicle up-close, gasps of wonder from the vast accomplishments of the space shuttle program, stunning imagery from the Hubble Space Telescope to the International Space Station that's up there today working in space." Other details about specific items to be displayed alongside the orbiter are being worked out, as well as exact the arrival date for Atlantis, officials said. 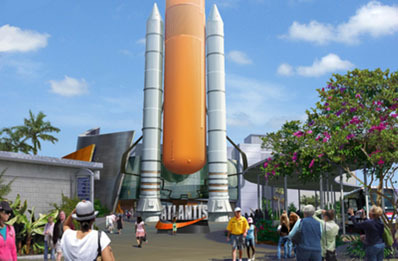 The tourism firm began work on the site last year when it removed the replica orbiter Explorer, an external fuel tank and the solid rocket boosters from the center's Shuttle Plaza area. A gantry still visible at Wednesday's groundbreaking will be torn down before construction of the Atlantis facility begins. Once three walls of the new building is up, Atlantis will be rolled in and the final construction finished, a spokeswoman said. "Atlantis' new home is beautifully designed to showcase her as the true engineering marvel that she is," said Janet Petro, deputy director of the Kennedy Space Center. 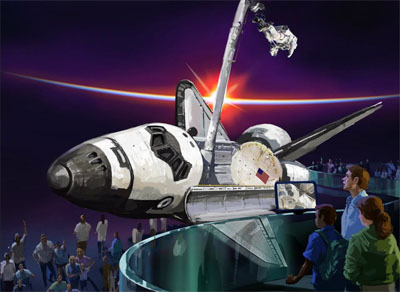 The building itself will have the appearance of the orbiter's sweeping wings and be colored with orange and blue hues to represent a shuttle's fiery re-entry. Outside, another life-size external fuel tank and twin solid rockets will be erected to stand 184 feet tall, giving the public a sense of scale of the space shuttle vehicle before walking inside to see the real orbiter. NASA Administrator Charlie Bolden awarded Atlantis to KSC last April, also sending Discovery to the Smithsonian's Udvar-Hazy Center outside the nation's capital, Endeavour to the California Science Center in Los Angeles and Enterprise to the Intrepid Sea, Air & Space Museum in New York City. "I think Atlantis belongs here. I think after the last flight and the last orbiter, I couldn't think of a more fitting place to display it for generations to come. Young men and women will come here with their parents and look up at this magnificent ship and inspire generations of future space exploration efforts," said Chris Ferguson, commander of the final shuttle mission. "This building is going to be incomparable," he added. Atlantis flew 33 times in a quarter-century of spaceflight, accumulating 307 days in space, 4,848 orbits and 125,935,769 miles traveled. See our special pre-launch photo gallery tribute to Atlantis. Construction of the spaceplane began in March 1980. She emerged from the Rockwell assembly plant in Palmdale, California, as America's fourth flight-worthy shuttle on April 6, 1985 and was towed over land to Edwards Air Force Base on April 9 for mounting atop the 747 carrier jet. The cross-country piggyback ride flew to Ellington Field in Houston on April 12 for an overnight stay before continuing onward to reach the ship's homeport at the Kennedy Space Center on April 13, 1985. Atlantis underwent preparations for an inaugural voyage, moving to launch pad 39A for the first time on August 30, 1985 and blasting off October 3 on a four-day classified military mission that deployed a pair of Defense Satellite Communications System spacecraft aboard an inertial upper stage booster. Several hush-hush missions for the Defense Department used Atlantis to haul a Lacrosse radar-imaging satellite into orbit in 1988, a stealthy bird and a top-secret data-relay craft on two 1990 launches and an early warning missile-detection spacecraft in 1991. Memorable scientific probes for interplanetary adventures -- the Magellan radar mapper to Venus and Galileo to tour the king of planets, Jupiter -- were launched in 1989. And the Compton Gamma Ray Observatory was put into orbit around Earth in 1991 to unravel mysteries of the Universe's most extreme and powerful objects. Atlantis' payload bay also served as the operating base for scientific investigations to study the atmosphere during NASA's Mission to Planet Earth program and experimented with the first tethered satellite system. The new era of cooperative spaceflight between the United States and Russia saw Atlantis at the forefront, flying seven trips to dock with the orbiting space station Mir for the delivery of goods and the exchange of American astronauts staying there for scientific tours-of-duty. That partnership blossomed into the International Space Station effort, and building the massive complex more than 200 miles above the planet has used Atlantis to lift the American laboratory module Destiny, Europe's laboratory module Columbus, the airlock named Quest, plus major sections of the outpost's truss backbone and power grid. And in 2010 she added a Russian module -- the Rassvet docking compartment -- to the complex. Atlantis also made the final service call to the Hubble Space Telescope, accomplishing a dramatic five-spacewalk mission that overhauled the iconic observatory with new scientific instruments and internal gear to bring about another revolution in discovery. The final mission to the International Space Station was one last run to deliver a year's worth of supplies to the complex and return large equipment back to Earth.